Safety Orientation in Construction Environments DVD Program addresses two of the most prominent safety issues confronting employers today, that of developing a good safety attitude in their employees...as well as providing introductory safety training. Thinking about safety should be as natural as thinking about other aspects of the job. Employees need to anticipate the possibility of accidents before they happen. Workplace accidents cause millions of people to suffer painful injuries every year, and cost business almost $90 billion per year in medical bills, lost wages and lost production time. 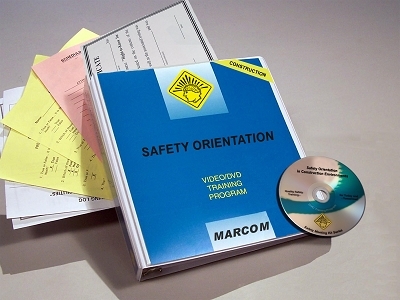 The DVD program includes information on developing safety awareness, basics of accident prevention, hazard evaluation, safety housekeeping, tool use and maintenance, use of personal protective equipment, and more. The DVD program comes with a comprehensive leader's guide, reproducible scheduling & attendance form, employee quiz, training certificate and training log.